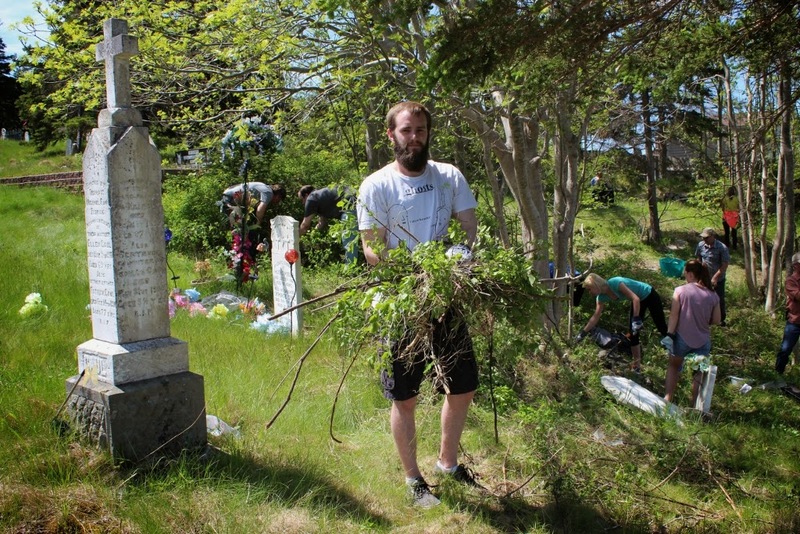 ICH Blog: Fine Day for a Cemetery Clean-up! Fine Day for a Cemetery Clean-up! The Make Midterm Matter cemetery crew. 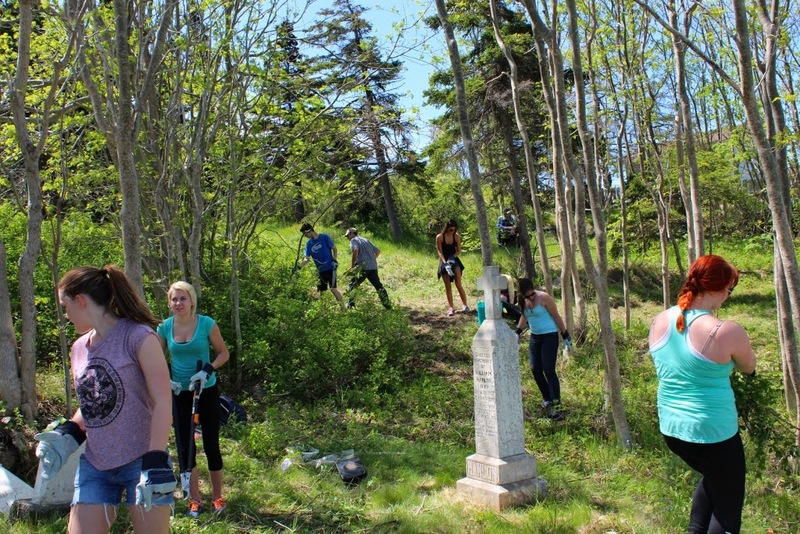 On Tuesday, June 24th the HFNL teamed up with students from Memorial University’s Anthropology 1031 to help clean up the RC cemetery in Portugal Cove. 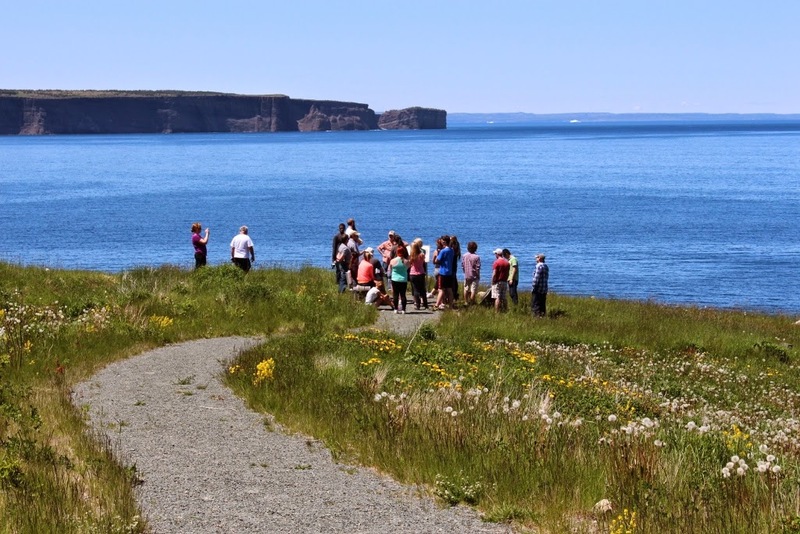 This event was a partnership between the Heritage Foundation, Memorial University, the Town of Portugal Cove-St. Phillips and the Roman Catholic Church--it was the first collaboration of its kind. Jeremy, a heritage/folklore regular, clears brush on his last day of class. The University’s “Make Midterm Matter” program inspired the collaboration, and the day-long session became part of the students’ curriculum. It was an interesting example of learning outside of the classroom. 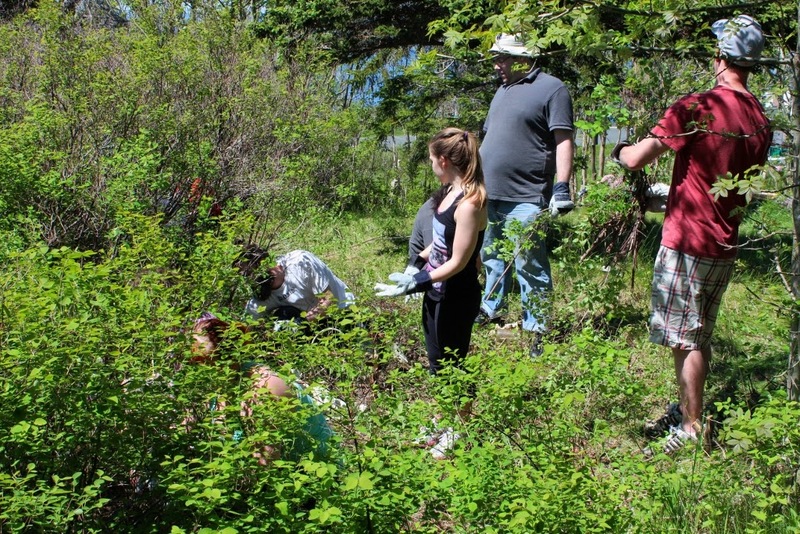 The students worked hard to clear sections of brush and small trees to uncover overgrown graves. While taking breaks from this labour, they also had interesting discussions about the different things a cemetery can reveal about a community. Reading the symbols or “motifs” on the graves themselves can show a shift from religious, community symbols such as the hand of God to more personalized inscriptions such as a fishing pole or a truck. Another discussion lead by their professor Sebastien Despres touched on the issues surrounding the maintenance of graveyards and the shift of responsibility from the family when there are issues such as resettlement and population declines. 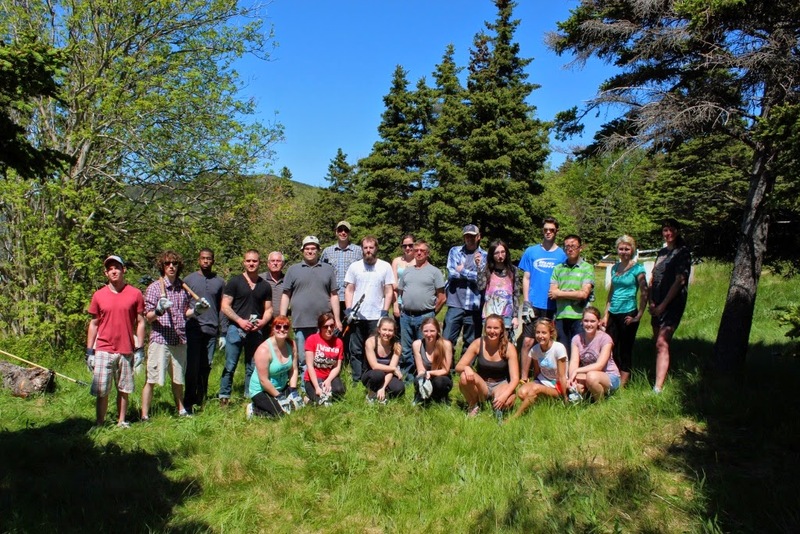 What I found it particularly interesting, as an observer, was how Dr. Despres was able to connect classroom material in such a meaningful way to the students and to a tangible place in their community. Both Dale and Lisa from the Heritage Foundation then offered their own knowledge and work experiences connected to Newfoundland cemeteries. Lisa discussed a restoration project she facilitated in Port Royal--a resettled community in Placentia Bay--and the challenges and rewards which went along with the project. Dale shared some ghost and fairy stories about graves, graveyards, and coffins and discussed how these tales relate to notions of respecting the dead. He also provided information about his research on Moravian dead houses and burial practices. Students hard at work in the RC cemetery. More hard work, uncovering a hidden grave. Visiting West Point burial site, which the town has protected from development. It was a great day of experiential learning under a bright blue sky....and the cemetery is now in great shape, ready to accept summer visitors. Thank you to the Jeff Lawlor from the Town of PC-SP, Richard from the Parish Hall, the RC Church, Sebastien Despres, the “Make Midterm Matter” group, and all the students for helping make this project happen.